Where the standard Cobra Trooper is more of a facility guard type soldier, the Viper appears to be more front line infantry. And this figure is a pretty cool update to a the classic look. The head of the classic Viper is probably the most distinctive part of his uniform and this is a pretty straight up update. Mirrored face plate with a blue over helmet. The helmet has some pretty decent detailing on it and looks pretty good for a soft piece over the vac metal face piece. My only issues with the head are design one. 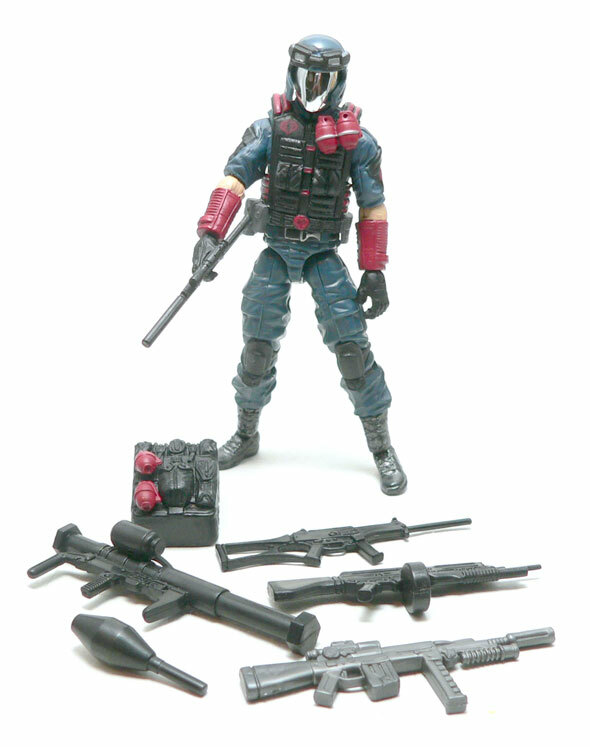 While it is a cool design and fits well with Cobra Commander, is a mirrored face practical for an infantry troops? Wouldn’t it reflect every bit of light and show your position? The second issue I have is why the googles? They give him a different look than Cobra Commander, but why does he need them? I have to say one of the things they accomplished with this figure was getting him to look like a guy in a uniform. With faceless figures its sometimes easy to make them look a bit more like a robot than human. To that end, he has a number of pieces from the Cobra Shock Trooper. Upper thighs and upper arms are from there, which brings with them pockets. The arm pockets are painted black and emblazoned with a Cobra logo. The rest of the arms are done with a red forearm guard and gloves with just a bit of flesh showing. The thing that seems missing to me is some elbow pads. Seems like every soldier has them these days. There are knee pads however. And pretty good ones. Molding the whole piece in black really gives it that strap look good around the back of his knee. I really like the way that this looks. The bottom of his legs remind me of a paratrooper the way they are tucked in. That might just be me though. The other key piece is his tactical vest. They’ve pretty much got these down at this point. This vest has some pretty nice detailing. It also has a couple different colors of paint most of the detailing is red but the pouches on the side are grey. His trio of Cobra logos if finished out with one on his chest. 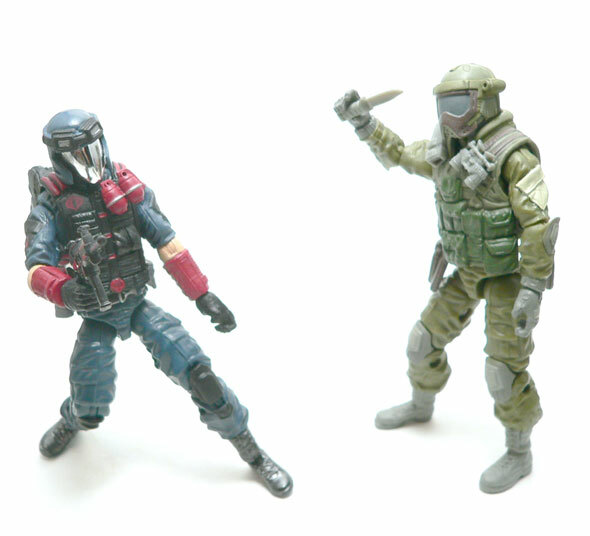 Like most of the other modern GI Joe figures, there’s no real issues with the Viper’s articulation layout. The vest is a little restrictive, but no more than any of the other ones we’ve seen. This articulation includes the new style wrist pivots we’ve been seeing, as well. 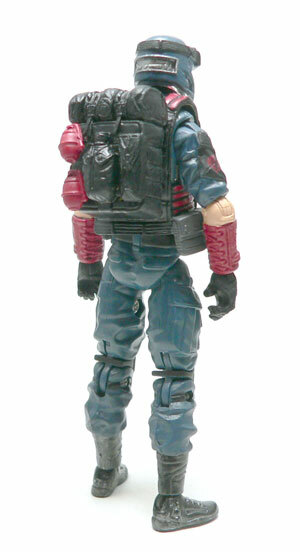 Compared to a good number of other figures, the Viper gets a pretty utilitarian back pack. I’m perfectly good with that. I love the canteen in the middle of and the red grenades are a perfect match for the ones on his chest. Where the Viper really shines is that he comes with a small arsenal. Four rifles and a rocket launcher make up for his lake of a personal handgun. The smallest gun is nearly a hand gun, almost a mini sniper rifle. The remainder of the automatic weapons are pretty well detailed. One is molded in silver, which for a change, doesn’t look half bad. I’m also loving the drum magazine on one of the others. The highlight weapon is the rocket launcher. And it’s a non springy, non working one! A pretty nice little anti tank weapon with a removable rocket? Well done, I say. I do wish he could hold it just a tiny bit better. You know, this is a figure I passed on in 2009, but upgraded for the 30th Anniversary line he appealed to me. 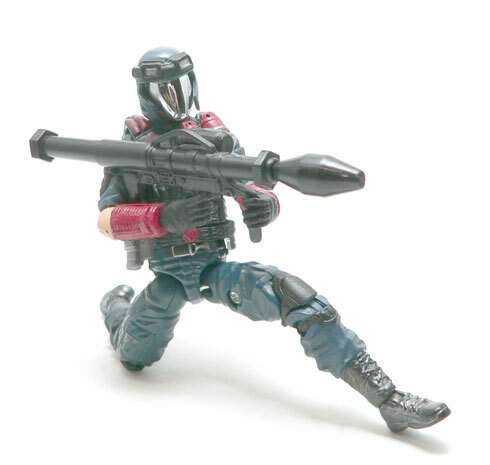 This version of the Viper looks like an infantry trooper in real gear. Maybe a little more movement would be nice, butthat’s really that is the only place I see room for much improvement. That is a really impressive figure. Excellent review! My biggest problem with these Vipers is I was an early adopter and troop built the heck out of the 25th anniversary Vipers! This is a great figure! There is so practicle reason for the goggles over the visor, but man doesn’t it look cool?? I remember when it was announced we were getting a Viper and the Joe boards were all a buzz and when it cam out it was instantly the most sought out figure as well as the most reviled because of the wrists, and for once Hasbro listened, it took a couple of years but this is where we ended up! As to the small aresenal, I love it! I like the direction Hasbro took with its army builderes in the past couple of waves: “give them all kinds of crap” its nice to be able to kit out 2-3 differant ways without having to borrow. I do kind of miss the “realistic” spring loaded rocet launcer that came with the previous version though. Great figure, great review! 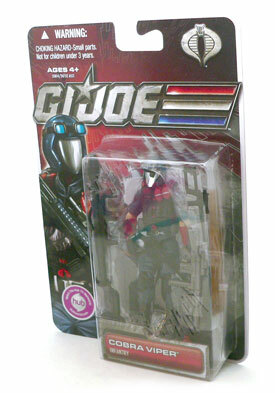 I tend to collect Cobra Troops in pairs, so I will probably get a second one of these. I have the same issue with the Star Wars Saga “Super Articulated Stormtrooper” from the early 2000. I have about 15 or 20, so I find it hard to justify buying new versions. Easily the best Viper ever, this is exactly what a Cobra Viper needs to be. The way so many collectors look at the ’86 Viper is the way I feel about this one. I have a dozen of them, I LOVE this figure.